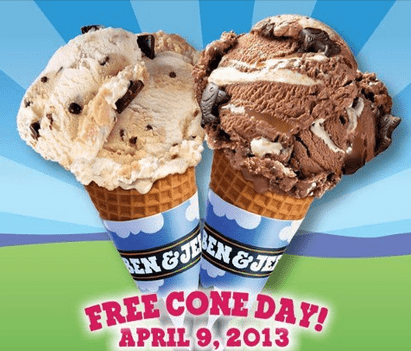 Ben & Jerry’s Canada Free Cone Day: Funkiest, Chunkiest Flavours For Free! Ben & Jerry’s has a Free Cone Day. This offer is valid on Tuesday, April 9, 2013. Swing by one of Ben & Jerry’s participating scoop shops around you and grab yourself a free cone. We’ll be scooping out the funkiest, chunkiest flavours ice cream for free. Click here for Ben & Jerry’s stores. i got Walmart, Shopper’s and Canadian Superstore….